1. 4 and 7 start it off by going around the pylon and getting pass from a forward, the D comes in and pivots preparing for the 1 on 1. 2. 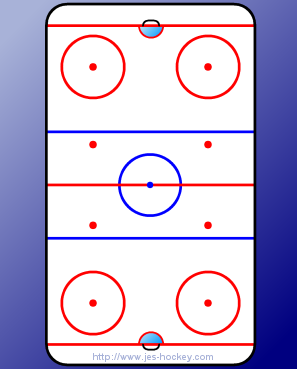 Once 4 and 7 have received there pass, the passer chases them down - back checking but not going past the far blue line and only disrupting the player and not removing the puck. Make sure they receive the pass before you start to chase them, make sure passes are good. 3. 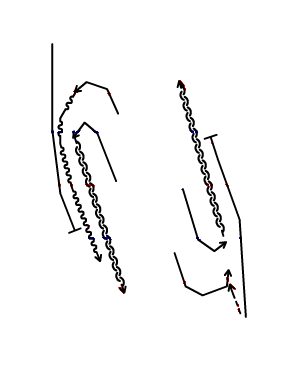 Once the back checker reaches the far blue line he stops and comes back around the pylon as shown receiving a pass from the next forward and the drill continues to repeat itself. -make sure all players return to their lines immediately after the 1 on 1 because there are a lot of active players in this drill. - use both sides of the rink.